Derek Rose is an English brand founded in 1926. It specialises in men’s underwear and nightwear. Derek Rose boxers are made in Czech Republic and England (only the most expensive ones). 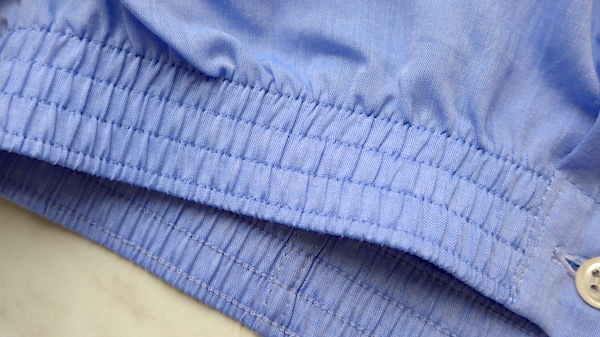 Classic fit boxers have inserted back panels with twin-needle stitched seams (4 stitches per 1 cm.). Their waistbands usually feature several rows of stitching. Modern fit boxers feature waistband with 2 rows of stitching, side vents, curved leg seams, no buttons and a centre seam on the rear side. Classic fit boxers from Derek Rose do have buttons, and they are made of mother-of-pearl, troca, plastic; they’re sewn on without shanks. Fabrics: pure cotton (2-ply at least sometimes; weaves: jacquard, batiste, poplin; light and regular weight), pure silk (weaves: satin, twill). Some boxers are made of double mercerised cotton fabrics. Derek Rose boxers are offered in a wide range of patterns and colours (stripes, checks, solids, spots, floral and fancy patterns, etc). All patterns are designed in-house in London studio of the brand. Available sizes: S, M, L, XL, XXL, 3XL. You can purchase Derek Rose boxer shorts at Derek-Rose.com (prices start at 32 GBP incl. VAT), MrPorter.com (prices start at 25 GBP, VAT excluded), MatchesFashion.com, NeimanMarcus.com. Sometimes you can find them on sales with discounts up to 50%. Classic fit boxers – waistband. 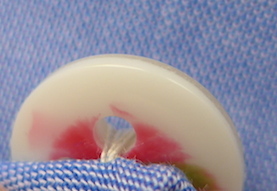 The reverse side of the button. This entry was posted in Boxers, England by Dmitry_Vasfilov. Bookmark the permalink.